I had a panicked email from a seemingly desperate cleric who is to sing the St. Matthew Passion for Palm Sunday. I am glad that he wrote today instead of next Saturday! He wanted help with the tone. As if I have time to record the whole Passion from St. Matthew and post it here! Sheesh! I did record the whole St. Matthew Passion and post it here! Years ago, in 2008, in my PRAYERCAzT project, which has lain dormant for a while. Once upon a time, I was regularly recording short podcasts to help priests new to all this singing in Latin thing get the tones and Latin into their ears. My podcast for the Palm Sunday Passion has a longish intro of beautifully sung chant from the Mass, but I get into the 30+ minute text soon enough. Here, Father! For you! And good luck with the singing. BTW… I mention the special tone for the part of the Passion excluded from the 1962 Missale. I have for years now improvised the last part, after the genuflection and silence, in the old tone. It works just fine and it is permitted. In my recording, I included the excluded part, lest we lose the sound and memory of that beautiful tone for the Passion. And for good measure… before someone asks. 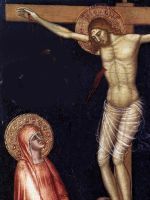 This entry was posted in "How To..." - Practical Notes, ASK FATHER Question Box, LENTCAzT, Liturgy Science Theatre 3000, Mail from priests, PODCAzT, PRAYERCAzT: What Does The (Latin) Prayer Really Sound L and tagged Palm Sunday, St. Matthew Passion. Bookmark the permalink. I love that. I miss the TLM. I think the singing actually makes it easier to understand. Although I wish I really knew Latin, I do always listen to it trying to understand as much as I can. Knowing the story in English does help. Father Byers has been teaching us some things over at his blog recently about how “the” inspired text of Scripture is that which is read in the Church (prior to becoming “the Bible”), and the teaching of the Church, reiterated a number of times, for instance in the Council of Trent and Vatican I, really is that the old Vulgate is that inspired Scripture (in the form in which it became “the Bible”). This is thought provoking about why Scripture in Latin just sounds so right to me. I’m afraid I don’t know Fr. Byers blog, but Anthony Maas, in his 1912 Catholic Encyclopedia article, “Versions of the Bible” has an interesting brief account in the section “Vetus Itala or Old Latin”, which includes the details that St. Jerome “made a cursory revision of the Psalter, which was used in the Roman Church until the time of St. Pius V, and is still [in 1912] retained at St. Peter’s, Rome, in the Ambrosian Rite at Milan, and in the Invitatory psalm of Matins in the modern Breviary. About 388, using the Hexaplar text as a basis, he revised the Psalter more carefully and this recension, called the Gallican Psalter from becoming current in Gaul, is now read in the Breviary and in the Vulgate.” I am not sure what, if any, bearing that has on the Psalm text of the Propers in the EF, but it is interesting how different stages of Latin translation and revision have lived on side-by-side in liturgical practice. Many thanks for this, with these – I have one thing and another on cds (serviceable in many ways), but do not know by heart how complete those are! I have not yet listened to your recordings, so hope you will pardon any duplication if I say that Joseph Otten’s 1911 Catholic Encyclopedia article, “Passion Music”, is quite interesting on the history of the declamation of the Gospel Passion narratives, and looks interesting as well about later musical developments (though I comment before having read it right through). It seems sad that the Bach Passions have become free-standing concert works to the extent that many people may not have a sense of their liturgical context, or ultimate background in this liturgical singing of the Gospel texts in Latin. Fr Byers’ blog is the most interesting Catholic blog there is (pace Fr Z :-). I don’t think I got it precisely right, in my above comment about what Fr Byers has been trying to get across to us; he keeps having us puzzle it out bit by bit and more precisely. But according to him continued work on a correct text of the old Vulgate is truly necessary for identifying the original-language texts (Hebrew, Aramaic, Greek) that are truly the inspired ones.